An interview with best-selling author and radio host Eric Metaxas. What on earth gave you the idea to write a children’s book explaining the rise of Donald Trump? For the record, I’ve written 30 children’s books and I’ve written for VeggieTales. My favorite collaborator on many of the children’s books I’ve done is the brilliant Tim Raglin. (He is the illustrator of this book!) Tim is the one who during the primaries convinced me to take another look at Trump. He kept saying “This guy is like a folk hero!” So when Trump won I thought, “Whoa! We HAVE to do a book on Donald Trump!” So we did. I also think that the best kids’ book also appeal to adults. So in a way this is really a humor parody book for adults. Did I mention it’s funny??? Okay, so you say it’s not really a children’s book. It’s just designed to look like one. But really, aren’t you trying to corrupt the youth? Recruit them for a xenophobic demagogue’s movement to shut down our nation to diversity? And put CNN reporters into internment camps? To be clear, not all of the reporters for CNN would go to internment camps. Some of them will go to re-education camps first. Others would be sent to Venezuela or San Francisco. So you’re saying I shouldn’t buy copies of it for the children of all my liberal friends? And give it them secretly with a big bag of chocolate covered espresso beans? Then make them promise, “This will be our secret, okay? That keeps the candy coming …”? You know, it’s like you have ESP or something. Because that is precisely what you should do. It’s just like when Soupy Sales asked kids to take money out of their mommy’s purses and send it to him. Seriously, though, I have a feeling half the sales of this book will be people giving it to liberal friends as a gag gift. It’s not mean. It’s innocent and fun. We have to be able to laugh. Especially at our political divisions right now. Got it. Anyway, I don’t have any liberal friends left. So do you have plans to do readings of the book in children’s libraries across the country? Maybe all those places that had drag queen story hours last year, just for balance? Actually I was thinking that I would do the library readings dressed in a caveman costume. But for the PC folks I’d say that I’m a woman who identifies as a caveman. 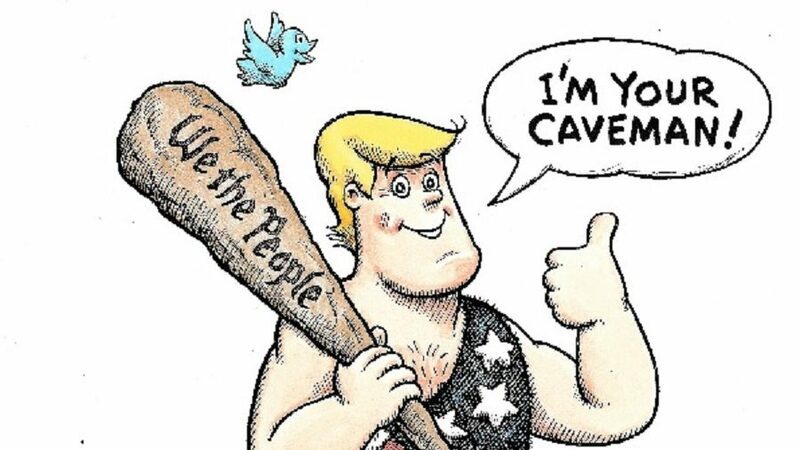 By the way, did you know that Elizabeth Warren is 44/100ths cave person? So are Rachel Dolezal and Caitlyn Jenner. 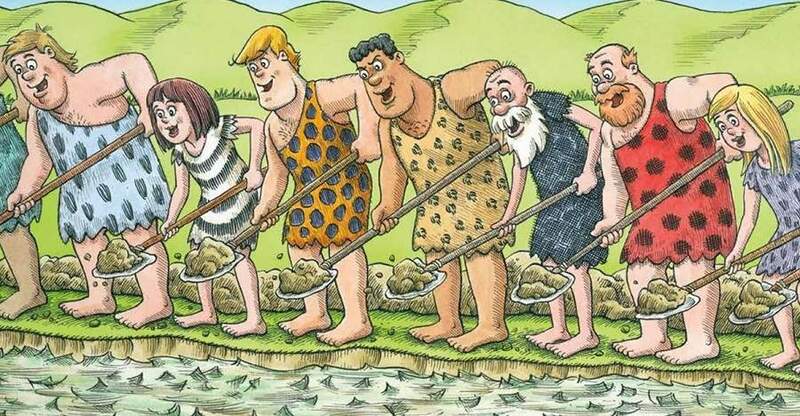 Turns out many of us are descended from cave people. Or Adam and Eve. It depends on your theology. And did you know that Eve was part Cherokee? I did not. Thank you! So what do you hope that adults can take away from this book? That the orange triceratops in the swamp looks a lot like former CIA chief John Clapper. And that the blue dinosaur called “Cryin’ Chuck” only wears the half-glasses to look intellectual. And that the red dinosaur that some people think is a Clinton are probably mistaken. But the illustrator won’t say, so we can’t know for sure. Oh, yes, one more thing, that a bloated federal bureaucracy filled with money is the enemy of liberty, and that we need to help Donald drain the swamp so we can take back our government from the bi-partisan swamp creatures! Tell me about some of the reactions. Especially the funny ones, the hysterical denunciations from po-faced, ostentatiously earnest social justice church people. For one thing, many bookstores refuse to carry it! No kidding. So please please ask the bookstores managers to carry it! Get up in their faces at gas stations and restaurants and at Ashrams — and at Cannes and Telluride and at all the Portland creperies — and tell them that censorship is not welcome in America!!! As for the people you mention, they don’t seem to know I exist. At least when they walk past me it seems like that. I’m not sure if that’s intentional or if all of them just have really crappy peripheral vision. 10) “If he handed out cups of Kool-Aid I would just trust him and drink it”? 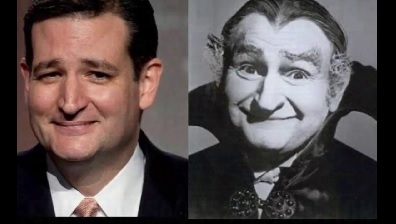 I can’t believe you think Senator Cruz looks like Al Lewis too! It’s like the two of us are Siamese twins of the mind! Speaking of which, Ben Carson was my preference before I settled on Trump. But before we leave the subject of Ted Cruz I should say that I also think sometimes he looks like Olivier’s Richard III. Minus the hump, natch. Of course I love Ted and Ben and a few others. But this was just Trump’s time. And I think he’s been not less than spectacular. Even his grossest errors are usually so entertaining that I’m tempted to overlook them. The name-calling is beneath him. But unfortunately sometimes it’s just so funny that I’m inclined to let it be my one guilty pleasure. I was going to take up vaping, but I really think this is the healthier way to go. At a certain age you have to think about that. On which issues has he most impressed you? President Trump, not Grandpa Munster. His preternatural ability to utterly block out the shrieking-and-howling PC mobs (by which I mean Don Lemon) and behave as if they don’t exist. It’s a staggering thing. Every other Republican in the past and present seems to bow to the pressure that the left — whether media or politicians — put on them, but Trump seems to have a real superpower not to be fazed by it. It’s otherworldly. And inspiring. Where has he disappointed you? President Trump, not Don Lemon. Well, it hurts to think about it, but he hasn’t tweeted about this book! Can you imagine?? I wasn’t going to bring it up, but since you asked … He has time to tweet about everything under the sun — even to tweet out rude phrases like “Up Shipp’s Creek” — but he still hasn’t found the time to tweet about how totally amazing this book is! Donald Drains the Swamp is probably the greatest book ever, and yes I’m including Tolstoy. Who wouldn’t include Tolstoy? Fabulous Russian writer. Have you seen this book Donald Drains the Swamp? I hear Hemingway is jealous he didn’t write it, and yes, I’m aware Hemingway is dead. That’s the point. Even dead, he’s jealous he didn’t write it! It’s just that tremendous of a book! Incidentally, Hemingway almost bought a condo from me in Key West. So yeah, it would be so easy for him to tweet about it! I’m convinced that a coven of MSNBC anchors has put a hex on the book, because really there’s just no other reasonable explanation for him not having tweeted about it yet. b) Scare people so much that his life would be safe for a second term in office? Speaking as an evangelical who adores Mike Pence, I think the president needs to do whatever he thinks is best for the country. I think most evangelicals, including Mike Pence, would agree with that. I also think it might mean doubling-down on totally raw blond dude awesomeness by putting Hulk Hogan on the ticket. Most evangelicals would totally be down for a Trump/Hulkster ticket! I know VP Pence especially would be stoked because once in the steam room at the Naval Observatory he showed me a “Hulkamania” tattoo on his lower back. It’s very tasteful. It might even have been a Henna tattoo that he just had made more recently. I didn’t ask. But yeah, I think all the evangelicals would be on board. Having the Hulkster a heart beat away from the presidency might be the best firewall Trump could ever have against impeachment! I also think he should put the Samoan Twins up to head the State Department and put a super gigantic memorial to Haystacks Calhoun on the National Mall. Or they could restore “Calhoun College” at Yale, but make clear that they mean Haystacks, instead of John C. What’s your next book project? I’m writing a spiritual autobiography about myself. Cuts way down on having to do research. I was going to write the book about someone more famous, but the people who decide what an autobiography is told me that wasn’t allowed. So yeah, it’s a book about how I grew up and became a follower of Jesus. There are a lot of hilarious passages in it, and of course they really happened, because an autobiography or memoir has to be non-fiction, unless you’re running for president. Several of the funniest parts are about my time at Yale, where I first encountered you. Are you still admitting that you went to Yale? Or have you started pretending (as I have) you went somewhere more respectable, such as the College of the Ozarks? What’s happened to Yale really is so incredibly sad. They were leftist-fascist leaning when we attended, as you well know, but they’ve really driven the boat over the cliff, and no, I’m not mixing metaphors. It’s just that crazy. Honestly, if Venezuela isn’t really careful, they could even end up like Yale. No joke. Remind people about your wonderful book Squanto, and the message we can draw from it about immigration policy today. You sure? Okay. Um … Hey everybody! After you get three or four copies of Donald Drains the Swamp, get a copy of my previous children’s book, Squanto and the Miracle of Thanksgiving! It’s amazing! I tell all about how a Patuxet brave named Squanto came out of the woods at Plymouth and helped the pilgrims. It’s a true story. Squanto also made them understand that in the future the society they were creating would be so awesome that strangers would walk for hundreds of miles just to get a piece of the action. So they needed to think about building a Wall as soon as possible, just to be safe. Obviously they didn’t believe him and heed his advice, and here we are. 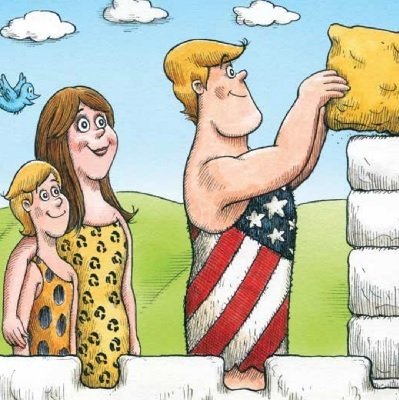 By the way, the next Donald the Caveman book is titled Donald Builds the Wall. We were going to write one called Donald Locks Her Up, but someone thought that that might not appeal to people who think that’s too good for her. There are always divisive kooks out there and you have to think about that. Do you have a Thanksgiving message for Stream readers? Funny you should ask, because no, I don’t. Oh okay, I guess I do. I hate to get serious, but my Thanksgiving message to Stream readers is that what the Pilgrims began in this country four centuries ago was genuinely blessed by God. It wasn’t mere luck or hard work that enabled them to remain here. Or that remaining here enabled their descendants to begin and steward what we call the American Experiment. And if we don’t honor that same God in our lives and thank Him for giving us the tremendous liberties and blessings we have, we will lose them. So part of giving thanks means doing all we can to keep the republic, because it’s a sacred trust and it was given to us by God, so that in time we could share it with the whole world. That’s right, it’s not just for us. God loves everyone and wants them to have the same liberties we do, so we need to take great care of those liberties. What will you be doing, spiritually, to observe Black Friday? At midnight I go out to a crossroads in Queens and bury a GI Joe w/Kung Fu Grip. If there’s a full moon I also bury a whole AFX HO-scale Slot-Car Set. The one with Magna-Traction. Those are the only toys I ever really wanted and if they were available on Black Friday I’d go buy some. But they’re not. Hence the ritual. Just please don’t tell anyone I do this because I’m deeply ashamed. 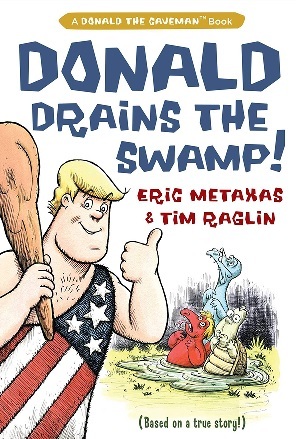 Eric Metaxas is author of many books, most recently Donald Drains the Swamp. This is solid gold comedy! Finished Bonhoeffer by Metaxas this year and it has legitimately changed how I view the church and evangelism for the better. Thanks for being voices of sanity in an age of madness. Agree on the Bonhoeffer book, and after extensive research, he wrote a book on Martin Luther in 2017 which clears up many misconceptions about Luther that have been floating about over the past 500 years. Love the book! Love to Laugh! Thank you both! Perhaps these illustrated works of contemporary conservative thought should be required reading ….for members of Congress ! Ok, you two must have conspired with the Russians to write this “interview”. There’ s just no way you could be that funny on your own. I would buy it for pure comedy.. That said I don’t agree with trump on 90 percent of stuff. Our family bought atleast 4 copies of Squanto and love it!!! So we will also get a few of Donald Drains the Swamp. Really enjoyed Luther and Bonhoeffer!!! Was really looking for some advice on making kids great again because we have five and are running out of ideas.